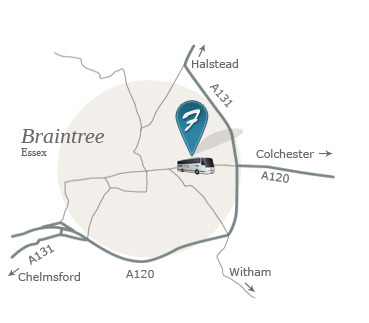 A local family business established in 1976 and based in Braintree in Essex (our location), Flagfinders provide a wide range of transport facilities. Our fleet ranges from 12 seats to 87 seats most of which are fitted with seat belts. We can offer executive and standard vehicles to meet individual needs. We have a continuous programme for upgrading our fleet. All our coaches and buses meet Ministry Test standards. We have our own workshops and pride ourselves on our vehicle maintenance. We are members of the Confederation of Passenger Transport (CPT).